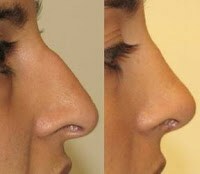 RHINOPLASTY"I struggled with confidence throughout my life being so self-conscious about my nose. From as earliest as I can remember, I always said how I wanted to correct the appearance of my nose through plastic surgery. Like many of you reading this post, I would constantly find myself researching into rhinoplasty. One day I spontaneously decided to take action and have a consultation with a doctor. I met with a few doctors before meeting with Dr. Suzman. It was his professionalism and adequate that stood out to me. Dr. Suzman's PA, Heather, was also so caring and intelligent! Dr. Suzman is truly amazing at what he does. You can tell how passionate he is about his profession from just meeting him. I am so happy I chose him as my doctor, because I am now in love with my perfect nose that he created! My recovery period went so smoothly as well, which just further proves how great of a surgeon Dr. Suzman is. Due to emergency circumstances, I was out in public two days after my surgery, and felt great! By the time I took my cast off I had little to no bruising and minimal swelling on my actual nose. I was expecting MUCH worse. I still can't believe I actually went through with this surgery. It was worth EVERY penny!!! I would recommend Dr. Suzman to anyone and everyone! Dr. Michael Suzman and Staff are amazing!!! I am so happy with his work, I can't even believe what they look like now. My breast were huge and hung down so low and were so painful. Now, they look young and perky but the best part is that I have no more back and neck pain. I can't give him enough stars. From the bottom of my heart, I am so thankful! BLEPHAROPLASTY This is my fifth day after blepharoplasty surgery and already I am very pleased with the results. I just have mild swelling that most likely wouldn't be noticeable to anyone and bruising is just a little yellow under my eyes now. My results are excellent and there is no visible scarring. For anyone considering this surgery, it is a very easy surgery and the recovery is painless. I was a little swollen on the first and second day after surgery and felt somewhat distressed, but Dr. Suzman reassured me that it would only get better and he was 100% right. TRUST HIM in his knowledge, experience, and his advise as he is truly an excellent Dr. I had another procedure with Dr. Suzman for septorhinoplasty only 8 weeks ago to correct an injury and by ONLY 3 weeks after the surgery, aesthetically it had totally healed and looked very natural. It was also a painless recovery. I didn't need any pain medication when I came home for either procedure. Really, he is an EXCELLENT surgeon with a gentle and polite manner. He is the best!!! He made me feel so comfortable and safe. The surgery was simple, quick and flawless. I had no fears. Naturally im in pain now, 4 hours after the surgery. But that is very normal. I have pain meds too. I would recommend Dr. Suzman to anyone!!! If you've been thinking about it for a long time- take the plunge. I finally did and I know I made the right choice. FACELIFT NECK LIFT Dr. Suzman performed my surgical lower third lift and I loved it. FILLER INJECTIONS. Dr. Suzman had administered Juverderm to my upper lip line in a way that restored volume without giving me giant bee-stung lips. I trusted him with injectables, so I sought out Juvederm Voluma for my mid-face. I can't rave about the results enough. Dr. Suzman is a magician with injectables...Trust him. He knows what he's doing. When the full effect of the injectables comes in, you will not be disappointed in the least. RHINOPLASTY SEPTOPLASTY I was 20 when I had surgery with Dr. Suzman. I was not happy with my appearance and had trouble breathing. Dr. Suzman was the first doctor that I saw and I immediately chose him because he made me feel comfortable as well as his PA, Heather. The surgery center was clean, and the nurses were by my side post surgery ensuring that I was comfortable. I could not be happier with the outcome of my rhinoplasty and septoplasty and I would suggest Dr. Suzman to anyone! FACELIFT, FAT GRAFTING, TCA PEELI was tired of looking so tired. I wanted a more youthful appearance to match the energy I felt inside. The facial rejuvenation did just the trick. I feel as if I look ten years younger. The chin implant was a procedure I'd wanted done for a very long time, but was apprehensive. Dr. Suzman put my mind at ease by answering all of my questions clearly and even providing very specific statistics to allow me to assess my own level of risk. My look change has been striking, yet subtle. Breast Lift with Implants From my first appointment, the team working with Dr. Suzman made me feel comfortable and at ease. Dr. Suzman answered all of my questions honestly and it was clear that he genuinely cares about his patients and their results. I never had a moment of doubt through the entire process. I am so pleased with my results and I can't believe I waited so long to do this. A great, supportive and professional team! Breast Reduction One of the best procedures. Dr Suzman created wonderful results. He reduced me to a D cup. This was determined based on my body type. The procedure was relatively quick and there was not much pain. He was able to perform this surgery using less incisions than expected, what scarring I do have is minimal. Michael Suzman MD is a plastic surgeon with offices in Greenwich CT and Westchester County NY. He is certified by the American Board of Plastic Surgeons and a member of the American Society of Plastic Surgeons. He performs both cosmetic and reconstructive surgery of the face, breast and body, including breast and skin cancer reconstruction. Some of the best known plastic surgery procedures her performs are rhinoplasty, breast implants, face and neck lift and abdominoplasty.